Background: In cases of chronic thromboembolic pulmonary hypertension (CTEPH), referral for possible surgical intervention is important because surgery can be curative. Surgery necessitates cardiopulmonary bypass and deep circulatory arrest with pulmonary thrombectomy and bilateral endarterectomy (PTE). If surgery fails, lung transplant is the next best surgical option. Medical treatment is also an important adjunct. 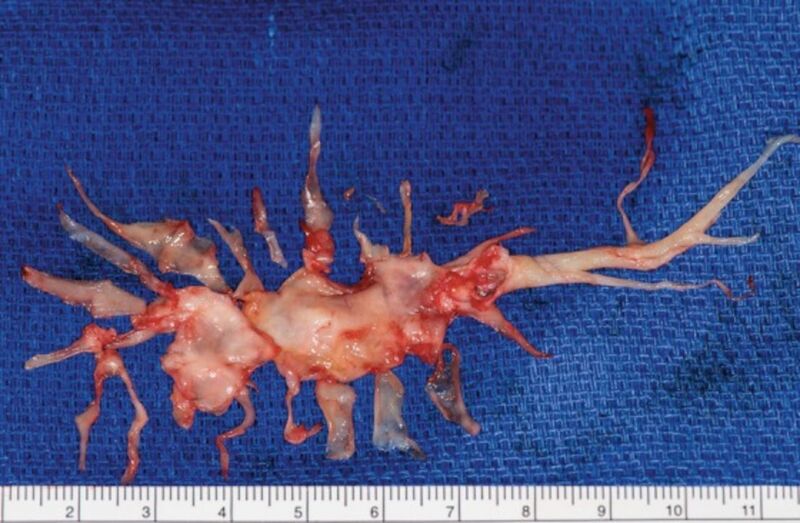 Case Report: A 35-year-old female presented 3 months after a pulmonary embolus was found to be completely occluding her left pulmonary artery. She was found to have pulmonary hypertension with a pulmonary artery pressure of 81/33 mmHg, with a mean pressure of 52 mmHg. The right atrial pressure was also severely elevated at 29 mmHg, and her echocardiogram revealed severe tricuspid regurgitation and severe right ventricular dysfunction. She underwent PTE and postoperatively was followed by the heart failure team. Her 6-minute walk distance improved from 396 meters at 1 month to 670 meters at 7 months, and her pulmonary artery pressure improved significantly to 55/17 mmHg with a mean pressure of 31 mmHg. The patient's right atrial pressure also improved significantly from 29 mmHg to 13 mmHg. Conclusion: CTEPH is likely underrecognized, and patients with pulmonary hypertension or a history of pulmonary embolism should be screened for CTEPH. This case illustrates the surgical treatment for CTEPH and discusses alternative and adjunctive treatments. Residual pulmonary hypertension after PTE occurs in approximately 35% of patients. Overall, 4-year mortality rates after surgery appear to be approximately 15%, and mortality rates correlate with the postoperative pulmonary vascular resistance. Recognition of chronic pulmonary thromboembolic disease as the etiology of pulmonary hypertension warrants evaluation for surgery. We present a case of surgical treatment for CTEPH and the patient's postoperative course. A 35-year-old female was referred for a mass in her left pulmonary artery. Three months prior to referral, she had been evaluated at a community hospital for shortness of breath and was treated for pneumonia. Her clinical condition failed to improve, and she was evaluated further. 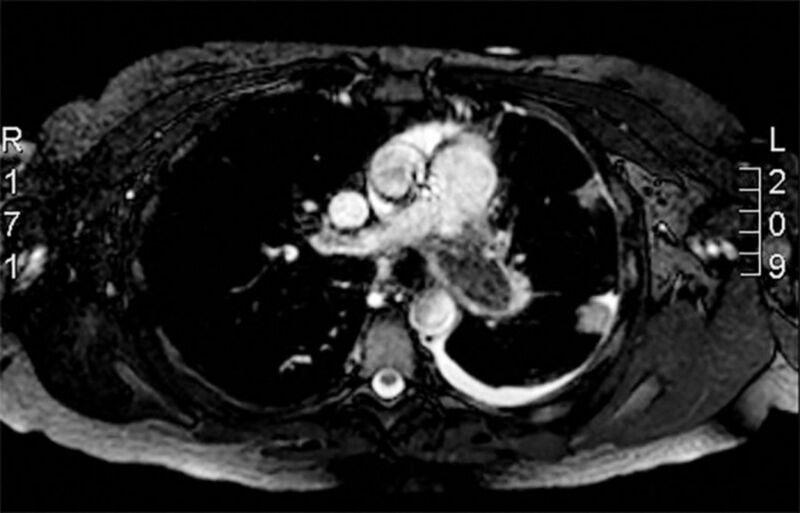 Computed tomography scan showed a large left pleural effusion and an occlusive mass that was suspected to be a pulmonary embolus. Ultrasound was negative for deep vein thrombosis. The patient was started on therapeutic anticoagulation. She continued to have shortness of breath and exercise intolerance and was referred to us. Our preoperative workup included a pulmonary angiogram that demonstrated an occluded left pulmonary artery and evidence of layered thrombi in the right pulmonary arterial system. Right heart catheterization showed an elevated pulmonary artery pressure of 81/33 mmHg with a mean pressure of 52 mmHg, a right ventricle pressure of 90 mmHg, and a right atrial pressure that was severely elevated at 29 mmHg. Cardiac magnetic resonance imaging showed severe right ventricular dysfunction, severe tricuspid regurgitation, and an ejection fraction of 47%, similar to what was seen on the echocardiogram (Figure 1). The mass was biopsied with negative results for tumor. The patient had a negative hypercoagulable workup. Preoperative cardiac magnetic resonance imaging demonstrating a thrombus occluding the left pulmonary artery. She was deemed to be a suitable candidate for surgery. A PTE was performed via a median sternotomy incision on cardiopulmonary bypass (CPB) with deep hypothermia and 55 minutes of circulatory arrest. Cannulation for CPB was performed with a standard technique in the ascending aorta with bicaval venous drainage from the superior and inferior vena cava. The patient was cooled to 18°C, and 20-minute periods of circulatory arrest were performed to facilitate exposure and technical precision for the endarterectomies in a bloodless surgical field. 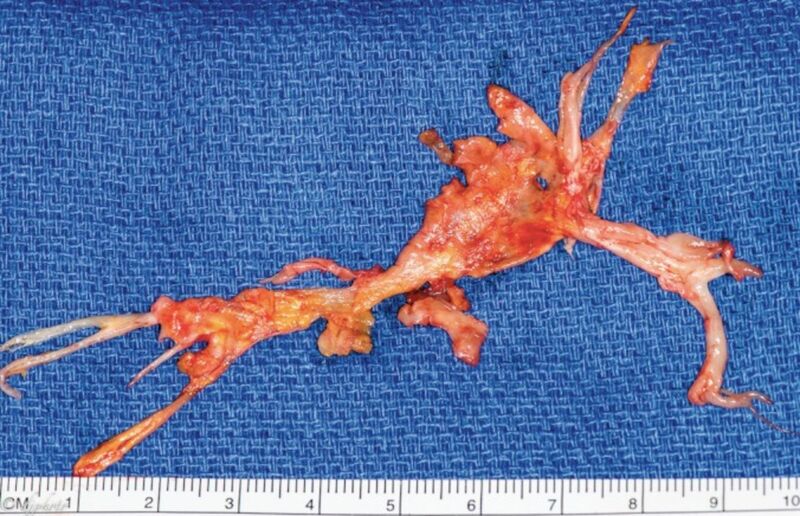 The left pulmonary artery was opened first through a longitudinal incision, and an embolectomy of the occlusive thrombus was performed followed by an extensive endarterectomy (Figure 2). The right pulmonary artery was then exposed under the superior vena cava (Figure 3), and an extensive endarterectomy was performed through a longitudinal incision (Figure 4). A third period of circulatory arrest was performed to complete the endarterectomy on the left side. The pulmonary arteries were then closed primarily, and the patient was rewarmed on CPB. After separation from CPB, right ventricular function and the tricuspid valve were examined with transesophageal echocardiography. The right ventricle demonstrated improved function with minimal tricuspid regurgitation. The systolic pulmonary artery pressure decreased from 70 mmHg to 40 mmHg measured directly by the pulmonary artery catheter. The patient did well, required no transfusions, and was discharged on postoperative day 4. At a follow-up visit, the patient reported significant functional improvement. She underwent 1 month of cardiac rehabilitation. She was able to return to work and had no physical limitations. She remained on anticoagulation with the plan to continue it indefinitely. At her 1-month postoperative echocardiogram, the tricuspid regurgitation was mild and has stayed mild with subsequent echocardiograms, as opposed to the severe tricuspid regurgitation seen preoperatively. Her 1-month echocardiogram showed an estimated systolic pulmonary artery pressure of 42 mmHg compared to the 81 mmHg measured by echocardiogram preoperatively. The patient made significant gains in her postoperative 6-minute walk distance (6MWD). At 1 month, she walked 396 meters; at 3 months, she walked 649 meters; and at 7 months, she walked 670 meters. Three months postoperatively, her systolic pulmonary artery pressure was estimated to be approximately 35 mmHg. The right heart catheterization performed at 6 months demonstrated an increase in the pulmonary artery pressure of 55/17 mmHg, with a mean pressure of 31 mmHg. The right atrial pressure was normal at 13 mmHg. The echocardiogram performed at this time showed mild tricuspid regurgitation and moderate right ventricular dysfunction with a normal central venous pressure. The patient was started on riociguat for persistent PH. She continues to be followed by the heart failure team. 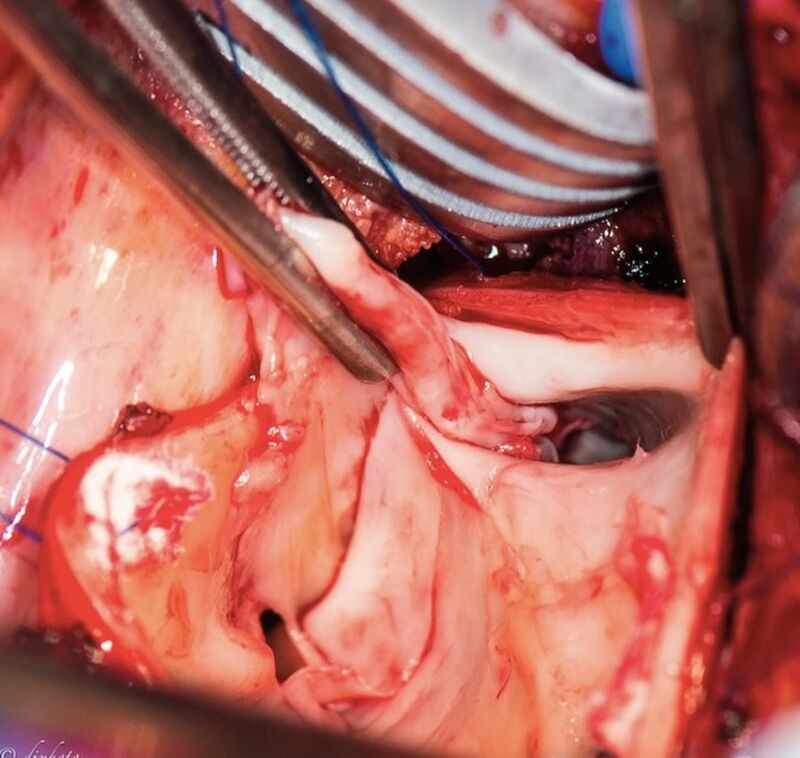 This case demonstrates the issue of a dysfunctional tricuspid valve that is tempting to fix at the time of the operation. This intervention is not necessary as the valvular issue usually resolves as pressures normalize, as in this case. Of note, the severity of the valvular disease does not necessarily correlate with the degree of PH. This case illustrates the surgical treatment for chronic pulmonary thromboembolic disease causing heart failure and the postoperative course. Taking a multidisciplinary approach to these complicated patients both preoperatively and postoperatively is important. CTEPH is sometimes considered a disease working on 2 levels as in our patient: she had the macroscopic target of the proximal thrombus and also consequent secondary damage to her lungs with extensive small vessel vasculopathy as evidenced by her residual PH. Although our patient had subjective symptomatic relief almost immediately postoperatively, the objective measures also changed and improved. It remains to be seen what objective benefit she may derive from her medical therapy. Recognition of chronic pulmonary thromboembolic disease as the etiology of PH warrants evaluation for surgery. The authors have no financial or proprietary interest in the subject matter of this article. David Fary provided the intraoperative photographs.